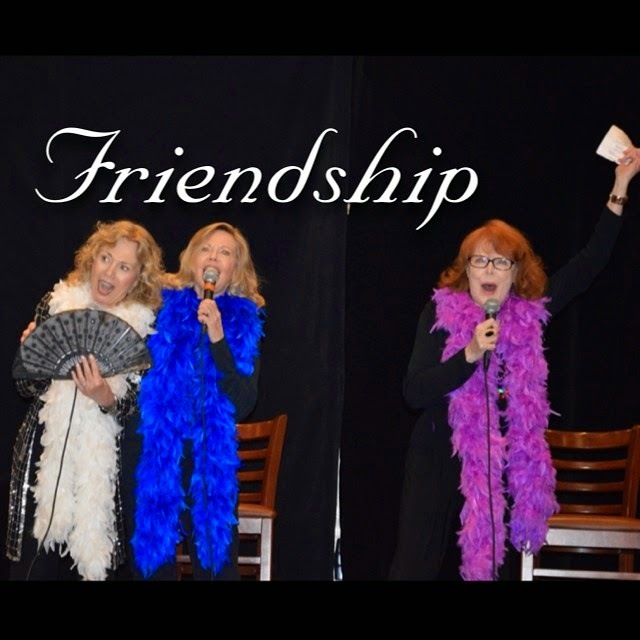 Here's the song Kathryn Leigh Scott, Marie Wallace, and I did at the festival in Tarrytown, June 2014. The fan who volunteered to do the music cue messed up and didn't know which button to push. Ah, show business . . .
K: I love doing love scenes with Jonathan, except when his fangs get tangled in my hair. L: He remembers his lines? K: Well, I do have to feed him a few, but he’s so romantic, don't you think Lara? L: Personally I think love scenes are boring. I liked our fight scenes. K. Yes, well, you are better at fight scenes. M: Now girls don't start. K: Has anyone seen my blusher? L: You know, Marie, in our scene don't you think you're a little over the top? K: Well that's the pot calling the kettle black. M: Are you saying I'm over acting? She's crazy! Crazy Jenny is crazy! L: I donno, all that screaming. M: That was when I was playing Eve, two months ago. What's happening to your memory, Lara?" L: Well, you acted just as crazy playing Eve. M : I wasn't crazy, I was the reincarnation of a convicted murderess. Remember?!! K: Don't mind her. Where's my blusher? L: Your hair looks really nice today. L: Is that a wig? M: You really are unbelievable. K: I've told you both a million times that no one else is supposed to use my blusher. L: Why is that again? K: I've got really nice skin and I need to protect it. L: Oh right, I forgot. Your face is your fortune. K: Yup, no face lifts for me. M: Please, we have to go on in a minute. K: (sees brush in Lara's hand) Is that it? L: Owww! You hit me! K: (picks up brush) Don’t be a baby. M: It's time. Come on, weve got to go do our scene. K: Nice costume, Lara. Too bad it didn't come in your color. M: Girls! We're all in this together, right? Remember . . . ? [Marie] It’s a good thing we teamed up years ago. [Lara] We're three of a kind, right? [Kathryn] Through smiles and tears! 1. [Marie] If you're ever in a jam, here I am. [Lara] If you ever need a pal, I'm your gal. [Kathryn] If you ever go so crazy you land in jail, I'm your bail. 2. [Kathryn] If you're ever down a well, ring my bell. [Lara] If you ever lose your teeth when you're out to dine, Borrow mine. 3. [Kathryn] If a vampire bites your neck, here’s a check. [Marie] If your neck begin to bleed, we can feed. [Lara] If they ever put a stake down deep in your heart, We won’t part. [Kathryn] If you fall from Widow’s Hill, here’s a pill. Ours will give a shout! 6. [Kathryn] If Louis rolls his eyes, call the guys. [Lara] If Karlen opens that casket one more time, I’ll go blind! Ours will still be slick! 7. [Marie] If you ever catch on fire, send a wire. [Lara] If they ever cut your throat, send a note. [Kathryn] If they ever make a cannibal stew of you, Invite me too! Ours is what the heck! [Marie] If a vampire steals your heart, we won’t part. Ours will still be swell!